Quiltville's Quips & Snips!! : Scrappy Mountain Majesties! Lap Quilt size approx 60"X70" before quilting. The large quilt above is 85" X 93"
It seemed that there was more green in the donated stash than anything, so I decided to look for a pattern that would use fabrics in two color ways. Here you see neutrals from white through gold to tan, and various shades of green including some almost-turquoise. You can start by making just one Mountain Majesties block at a time to get the technique down. When you get the idea and the light goes on as to what you are doing, you can easily chain stitch batches and assembly line the steps. Start by taking two squares, one light and one dark and putting them right sides together. With your ruler and rotary cutter, slice through the two squares from corner to corner. Chain piece these large 1/2 square triangle units through your machine with a 1/4" seam. Press squares open with the seam towards the dark triangle. Take the triangle squares to your cutting mat and square them up to 8" square. This is an important step. You COULD cut your original squares at 8 3/8" and perhaps get away without trimming, but I find the larger the triangle squares, the more unwieldy they get no matter how accurate your pressing and sewing is, so I cut them 8.5" and then square up to 8". When your squares are squared up, layer them one on top of the other, with the dark of the top triangle on top of the light of the bottom. This way you will be sure that you have one 'uphill' block and one 'downhill' block when you are done cutting. Cut 2" segments through both layers as shown. carefully peel the top layer off the bottom layer and you will have uphill and downhill strips! Simply rearrange the strips into the Mountain Majesties blocks and stitch together. Notice that by turning the blocks you can have a dark mountain with a light sky, or a light snowcapped mountain with a dark sky behind it. *Note* for the streak of lightning variation, the quilt is made with all downhill blocks, no uphill blocks at all! So instead if placing your triangle-squares with right sides together, you would stack them one on top of the other both facing up and cut both squares the same way. To complete the lap size quilt you will need 64 blocks. 32 uphills and 32 downhills. Arrange the blocks in the layout you find most pleasing and stitch the quilt top together. I bordered the quilt with a 2" cut (1.5" finished) inner border of light green, and a 5" cut outter border of a green floral that pulled together the whole quilt top. It is also bound in green. You can easily make more blocks and make this quilt bigger to suit your needs. Just remember that when figuring out how many blocks you will need, that the blocks are longer than they are wide. The blocks finish at 6" X7.5" so keep that in mind. If you make an even number of blocks across and down, the quilt is still going to turn out longer than wide. have you done these scrappy? I love your site look forward to seeing more soon. Scrappy Mountain Majesties. Any suggestions on what quilting pattern to use. Will be doing an edge to edge panto. Oh. My. Stinkin'. Gosh!!!! So terribly easy!!! Thank you so much for showing it. I live in the mountains of Virginia and I love the mountains. What a s simple way to do this quilt block. Thank you. Wonderful! Nice and easy pattern that LOOKS tricky, but isn't! I can't wait to give it a shot! Thanks Bonnie, love all of your scrappies. You are so clever! Estou aqui para elogiar seu site que é maravilhoso, e agradecer especialmente por essa receita. Eu estava à procura dela há muito tempo. Thank you for posting this pattern! I had fun making it! Absolutely amazing! Thank you for your simple yet thorough explanation!!! I can't wait to get started! I'm a new novice quilter and this looks like a perfect starter project! Thank you SO much for sharing! Our guild made this quilt as a raffle quilt using all different blues and creams. We were to mix up the blues and creams within each block and everyone contributed several blocks. We ended up with TWO raffle quilts - one with the blocks made as per the instructions and one with the blocks where each blocks blues and creams were all the same because so many of us forgot to mix them up. Both turned out BEAUTIFULLY, I liked the pattern so much I used it to make my son's college quilt. It is very simple. A keyboard border finished it off nicely. Thank you, Bonnie, for sharing such wonderful patterns to quilters. Love this quilt!! Am having surgery BMX in few weeks , will be really great to have something like this to do! Thankyou Bonnie for all of your beautiful free patterns! Love this pattern. My 2 sisters and I are making different versions of it. Do any of you have a tip on pressing the seams?? 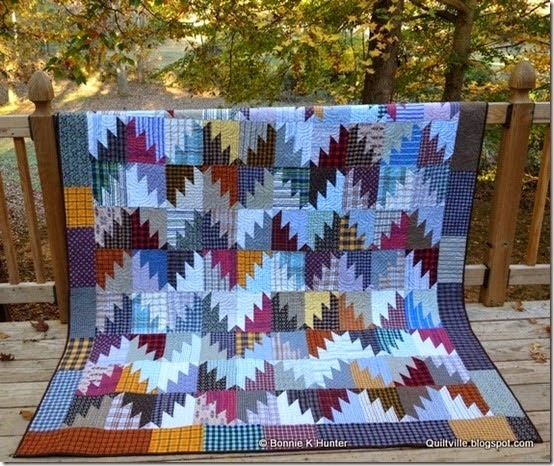 Just love these quilts and the great pattern Bonnie! Thank you so much! Marvelous Darling - Marvelous. Just getting started on mine. I'm making it king size. With all the 200+ patterns I have here at my house, I love yours the best !! This will be SEW perfect baby quilts with soft cotton flannels. Thanks for your wonderful tutorial. Just finished my blocks today! All from my stash...oranges, gold, purple and green. It is very saturated and awesome! Love how easily it's going together. I think I'm going with Stacked Lanterns layout. I am just starting my blocks, having collected recycled shirts for a while now. [I just scored a size 5X nice bright plaid shirt @ Goodwill yesterday after work! Here in Pittsburgh Men's shirts cost $4.29 regardless of size] When you sew the HS together, you naturally press seam allowance towards the darker. When sewing the 2" strips together, is there a certain way you press the seams? Or do I need to wait until I have them all sewn and arranged and *then* press alternate rows in alternate directions? Many thanks for great patterns. Plz come back to The Burgh. I attended your evening talk but could not go to your class due to work. Considering your advance bookings, by next time I may be retired! Thank you Bonnie for this tutorial. It came across my facebook page a few weeks back and I knew right away it was what I needed for a pieced border for one of my quilts. Saw this pattern on Printerest, for my to do list. still a beginner though. Thanks for this pattern. I have finished a queen size quilt by stash busting my blues. It's for my sister's 50th birthday. I used the blok lock ruler for the half square triangle trimming. That was great. Instead of cutting my 8.5 inch squares on the diagonal, I drew the diagonal line and sewed 1/4 inch from the line on both sides before cutting. I find this much easier to control. I love the pattern - it's so easy. I'm using scraps from a quilt to make this for the back side of the quilt. Thanks for the pattern.You can crash our retreat Appril 2nd week Mon thru Thursday GA Bapt conference center Toccoa,GA.We are Currahee Quilters.